It seems only on this record. I'm just wondering if it is in the record itself, or in my turntable hardware? I have an AT100E cartridge. Any idea what it could be? Woud a different stylus (line contact instead of elliptical for instance) improve this problem? If you only have it on that record, I wouldn't worry to much. It's the record imo. The FRiNgE and BrilliantBob like this. Sometimes it's not only this record but the recording. Try a digital version, if it also has sibilance than it's not your cartridge. Eric Murphy, mikeburns, patient_ot and 4 others like this. Yup. Tape saturation, the use of a compressor or limiter can cause this on a tape recording. I have the same deal with a brand new copy of Norah Jones' Come Away With Me. Excessive sibilance on the last ~25% of each side, only this one record, tried different styli, tried realigning to different standards but no dice. Can't figure it out. Most likely a defective record or recording. tin ears and The FRiNgE like this. If it is a new record, it happens that they cut them to hot. There is usually no "precut" distorsion in new records. I have had a few new pressings that show the same, but distortion is on average lower using my Shure V15Vx/JICO SAS stylus. So the answer is: probably you can benefit with a finer stylus AND lower moving mass for hot cut pressings. There should be some alternative stylii for the AT100E for upgrade purposes. If your VTF, SRA(92), azimuth, cart alingment and anti-skate are OK, the vinyl is a bad pressing. You can increase the VTF targeting the cart recommended weight. No big differences between a spherical stylus and an ordinary elliptical stylus, only more soundstage and fuller. The distortion and phase error will, therefore, be less but not completely eliminated. If the recording is ok by checking a digital source, then it's probably the record. If it's a new pressing, then it could be cut hot as other members have said. I have been doing some digital mastering, and I must say, some of the sibilants in the waveform can very high amplitude. When cutting a lacquer, it's worse. 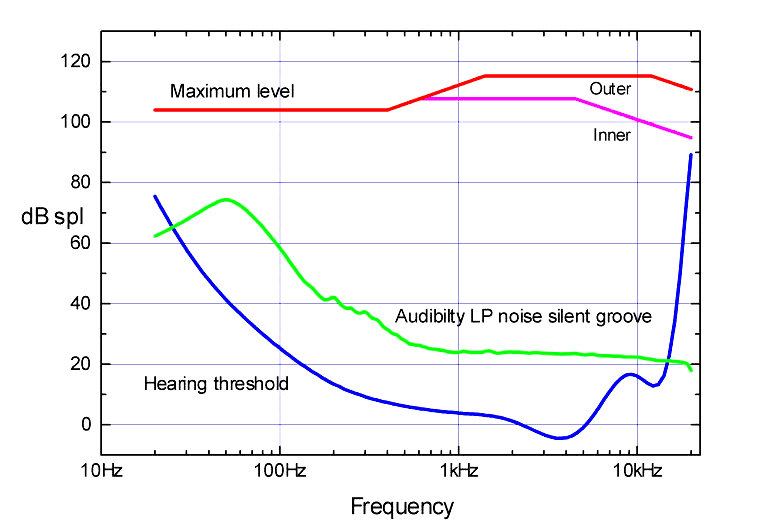 The RIAA pre-emphasis amplifies the sibilant frequencies by about 10dB, so these can be the most crazy "wiggles" in the groove. The amps driving the cutting head can clip, and would clip first at the strongest sibilant frequencies. It could be record isn't defective, and we have no way of knowing except to try a line contact. Most high quality cartridges with an elliptical are excellent performers, and will track all but the most difficult passages. edit: A hot pressing increases its dynamic range. The mastering engineer may have done an excellent job on the Oldfield record in question, but need a stylus that can track it! Leonthepro, patient_ot and Gramps Tom like this. No big differences between a spherical stylus and an ordinary elliptical stylus, only more soundstage and fuller. Can you elaborate on what you mean here? Particularly as far as sibilance and inner groove distortion is concerned, stylus shape is critical. A common .7mil spherical stylus have a greater contact surface than a common cheap .4x.7mil elliptical stylus. The smaller the diameter of the side radius, the better the stylus can track/follow the high frequencies - suddenly sibilants no longer distort! Mistracking can cause distortion/sibilance even when using high quality styli. I found also a very interesting study released by Discwashers Laboratories in March 1981 about how important is the VTA/SRA value for the high end styli. For people who hear no differences between 44.16 and 192.32float is useful to check if their audio systems can play higher formats using Hi-Res players with WASAPI or ASIO drivers. The problem record for me vis a vis sibilance is the Sundazed reissue of Parallelograms by Linda Perhacs. It is far and away the most sibilant pressing I own. Nothing else comes close. I believe Kevin Gray cut this one which makes it the lone disappointing mastering from his hands that I own. I think that 99.9% of the time, the problem of sibilance comes from the record itself. The reason is self explanatory, if not every record has a problem with sibilance, then you know it's not your equipment. When your TT has the superior advantage/convenience of removeable and interchangeable head shells, plus you have multiples with different cartridges mounted, you will find that no matter what quality cartridge you use, most will have problems with sibilance on the same records. If you start hearing it on a LOT of records I would be concerned, but it's probably just the cut or mastering on the recording. Find another copy of that album, maybe it won't be an issue. If your best sounding record still sounds good, then your setup is o.k. That's the pain of vinyl, "variables". In record mastering, it is possible to faithfully record levels that can't be played back without mistracking distortion, either because the acceleration is too high for the stylus to remain in contact, or we experience the "pinch" effect, where the waves modulated into the groove are actually smaller than the tip of the stylus. Records and cartridges have a limited playback level, one that decreases with higher frequencies and decreases in the inner parts of the record. Atonal vocal siblance and drum sounds such as cymbals and snares can extend into the ultrasonic frequencies, and make for very hard to track audio when they aren't filtered or controlled in mastering. You've identified the sound of mistracking. A cartridge with an advanced-profile stylus and a better-tracking suspension can resolve more information without this distortion. A tonearm alignment optimizing the center of the disk (or a linear tracker) can better play the most challenging sections. patient_ot and Leonthepro like this. It seems only on this record. I'm just wondering if it is in the record itself, or in my turntable hardware? I have an AT100E cartridge. Any idea what it could be? Distortion in left channel = too much anti-skate. Distortion in right channel = too little anti-skate. I have also found that a little more tracking force can help. I would try the tracking force first. Also clean the stylus. I believe you have this backwards. The left channel is the inner groove wall, and anti-skate is designed to prevent the cartridge from favoring that side of the record. Therefore, too much anti-skate would force the cartridge against the outer groove wall/right channel causing any loud sibilance to splash to the right side of the soundstage. You are incorrect. Too much anti skate will cause the stylus to lose contact with the inner groove wall causing distortion in the left channel. Too little anti skate will cause the stylus to lose contact with the outer groove wall causing distortion in the right channel. tin ears, The FRiNgE and BrilliantBob like this. The FRiNgE and c-eling like this. Well, sort of. If that were totally true then the stylus would constantly be leaving contact with the groove because no anti skate setting is ever correct across a whole album. If your good on both above then its probably just a badly produced record or your stylus is worn which is unlikely if its under 500 hours old. So many variables Leon, I had a 150MLX that was worse than my AT7V for baked in S.
Yes, I often feel disappointed in users who just assume one or the other before investigating and telling the poster to buy a better cart or just saying its unsolvable. izgoblin and c-eling like this. Good call on checking the digital, I'll head over to the tube and try searching someone who has upped a video playing the same tune (on vinyl), usually gives me a good clue.